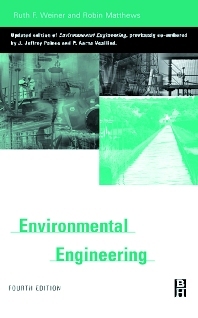 Environmental Engineering, Second Edition provides a comprehensive introduction to air, water, noise, and radioactive materials pollution and its control. Legal and regulatory principles and risk analysis are included in addition to engineering principles. The text presents the engineering principles governing the generation and control of air and water pollutants, solid and hazardous waste, and noise. Water quality and drinking water treatment are discussed, as well as the elements of risk analysis. Radioactive waste generation and treatment in relation to the nuclear fuel cycle, are discussed. The health and environmental effects of all these pollutants are discussed. An introduction to the Federal laws and regulations governing pollution is included. Member of the National Academy of Sciences advisory panel. Former Professor of Environmental Studies at Western Washington University for 19 years. Robin Matthews is the Director of the Institute for Watershed Studies, a Professor in Huxley College of Environmental Studies at Western Washington University. Dr. Matthews received her graduate training in aquatic ecology at Indiana University (M.S.) and Virginia Polytechnic Institute and State University (Ph.D). Her undergraduate work was done at the University of California, Riverside. Prior to coming to Western Washington University, she worked as a full-time consultant in the areas of hazardous waste management and pollution control, and as an environmental scientist for DuPont at the Savannah River Laboratory studying the effects of heated effluents from nuclear production reactors on 150 miles of the Savannah River and adjacent swamps. Dr. Matthews has published and presented over 100 journal articles, reports, and conference papers. Her major research areas include aquatic ecology and pattern analysis of large ecological data sets. She is the principal investigator on the Lake Whatcom monitoring program funded by the City of Bellingham. She teaches limnology, stream ecology, aquatic and environmental pollution, and statistical ecology.